Home / Castle Rock / Horror / Hulu / JJ Abrams / Stephen King / supernatural / Television / The Spookiest Town In the USA? The Spookiest Town In the USA? 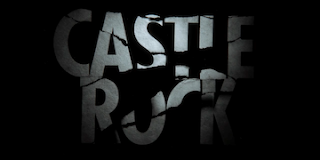 Castle Rock is a Hulu series about one of the infamous towns in Maine created by the prolific horror writer Stephen King. It contains a lot of nods and Easter eggs that he wants you to ignore but it is extremely hard to do if you are an extreme fan of his connected work of fiction. That being said, I do wish I had less of a working knowledge of the extensive connections to his other things so I could enjoy the show for what it is- a slow burn mystery with supernatural elements. The story of Castle Rock concerns a lawyer named Henry Deaver and his client, an unknown young man who has been locked up in the Shawshank Prison for a number of years. Henry is a lawyer known for representing people on death row in Texas. He is more well known as the boy who went missing for eleven days and survived during the winter in 1991 to the residents of his former town of Castle Rock. Henry is called back to the town after the warden of Shawshank commits suicide in a spectacular fashion and the young man he has hidden in an abandoned section of the prison is discovered by the new warden and two prison guards. The shady past of Henry's winter and the reason behind the incarceration of unknown inmate that they call The Kid is the main focus of the plot of the series so far. How this all affects the town on a decline with it's own dark history is the reason why I'm tuning in. Henry and his mother Carr... I mean, Ruth. For a fan of King's work, there are several implicit and subtle nods to his other works. The story takes place in Castle Rock so there is already connections to the stories that took place there. Characters from Needful Things, The Body and The Shawshank Redemption are directly mentioned and Cujo is alluded to. In addition to this, several familiar names pop up, either a direct reference to the characters or relatives of characters we have met before- Merrill, Torrance, Desjardin, Chambers, etc. We also have a couple of actors who have appeared in King's works before which can prove problematic when in these new scenarios and you have to divorce them from their prior roles in a show with connective thread to King's former work. 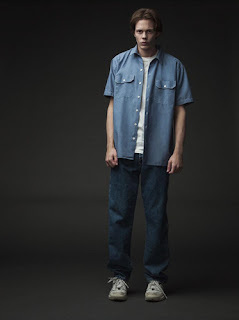 Bill Skarsgard is the incarcerated Kid with spooky abilities but I often have to force myself to forget that he is also the current Pennywise. Sissy Spacek in the role of Ruth Deaver is a little easier to separate in my mind from her role as the titular character in 1976's Carrie. All these little connections are neat but it gets hard to focus on the show when you recognize a reference to something else in the King bibliography. Or you make jumps in what you think things mean because of prior knowledge which is what happened to me during the first flashback to 1991. I wish all these connections weren't as obvious because I think this show has definite potential to be something great. The non-King references are amazing, particularly a "blink and you'll miss it" nod to the old Twilight Zone episode The Howling Man. 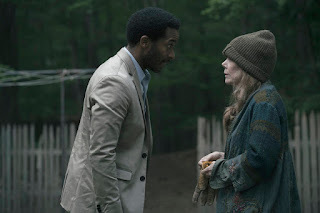 Castle Rock feels to me like a creepy version of Haven at times, another King adjacent creation with less Easter Egg usage that aired on SyFy. They both are about small Maine towns, the residents of said town with secrets, and an "outsider" returning to have an effect on the entire town. There is also a weird time thing they both seem to be working with which may prove to be very good if I think it is going the direction I think it will. All in all, I think Castle Rock can be a good show if it doesn't fall into a huge reliance on "wink, wink, nudge, nudge" references to older King fiction. I would highly recommend this show to people without any knowledge of the works of Stephen King. I think there will be more enjoyment in it for those viewers who come into this with limited to no idea of what went on in the past of King's dark history of Maine. I'm sticking with it while trying to leave any preconceived ideas of what will happen out of my mind. If you are a King fan and can do the same, then Castle Rock will probably entertain you as well.